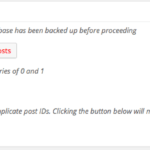 I’ve updated my handy plugin Add to All in the WordPress.org repository and existing users should be able to update this plugin from within the dashboards. In the latest version of the plugin, I have included a few placeholders for more dynamic texts. '%year%'       => date( 'Y' ), // A full numeric representation of a year, 4 digits. '%month%'      => date( 'F' ), // January through December. '%date%'       => date( 'j' ), // Date - 01 to 31.